Ask a variety of current Colorado College students what they’ve learned most from working collaboratively with faculty on research projects and the common answer is patience. Patience is key, no matter the department or area of interest. It plays a role whether a student is digging through pages of historical literature, testing chemical compounds, or transcribing manuscripts into digital format. Of course, it’s just one of many skills students learn. And students aren’t the only ones growing through this process. As Jane Murphy, co-director of CC’s Summer Collaborative Research Program (SCoRe) and associate professor of history, said, the model of student-faculty collaboration is not just rewarding in the amount of work that can be completed toward a specific agenda, but it can facilitate new types of ideas and relationships. “The beauty of the Block Plan is we’re all about each other, the 26 of us in a room, but what happens outside that in each other’s lives, I don’t think we see a lot of,” Murphy said, adding that research projects give students an opportunity to experience a professor’s day-to-day life outside of the classroom, and vice versa. It’s not only a graduation requirement for majors to complete research with a professor, but it’s also an expectation for faculty to mentor students in this way. Assistant Professor of Chemistry and Biochemistry Amy Dounay ’96 explained that it’s just understood to be a part of what undergraduate training involves. Emma Krakoff ’16 is one of about a dozen students to have worked with Dounay since the professor arrived at CC three years ago. 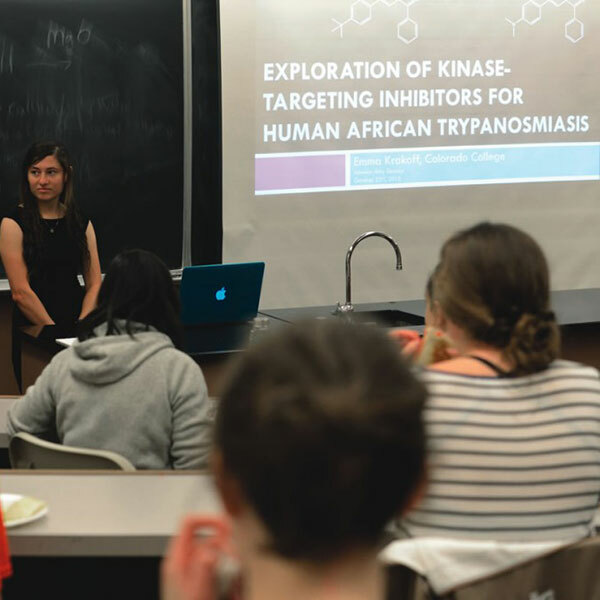 Krakoff and Dounay have collaborated on Dounay’s research directed toward identifying new medicines to treat African sleeping sickness, a disease that affects a fairly small number of people in Africa, but one that, more importantly, no big pharmaceutical companies are working on. On both the humanistic social sciences and human-ities side of things, student-faculty collaborative research projects are a bit newer to the game. “The [Andrew W.] Mellon Foundation has played a role in quite explicitly calling on the humanities and humanistic social sciences to engage, and the field has,” said Murphy, thanks in part to the New York-based foundation’s grant-awarding to institutions of higher education specifically in support of strengthening humanities and arts programs. “We’re not deeply behind the curve, but we’re not far ahead … there’s definitely room to expand this program,” said Murphy. the digital humanities grants came to her attention,she wondered if there was a way to integrate better software into what she was doing. She asked Faughnan, who was interested in applying computer science to history, to research possible options. a topic she’ll present a paper on to the Middle East Studies Association in Denver this fall, likely with Faughnan in attendance. use his coding skills to increase efficiency. He designed a very concise reference software program that allowed Bañagale to search for a certain measure in “Rhapsody in Blue,” pull up multiple digital images of that measure, and compare them at the same time on one screen. It was a definite improvement over opening individual image files and trying to figure out where he was in the score. Rice plans to further develop a stand-alone software option that other researchers can use in their work on additional editions for the Gershwin Initiative. Bañagale has worked on research with a handful of students since he began in his role four years ago, perhaps driven by the fact that as a graduate of CC’s class of 2000, he himself benefited from a student- faculty research collaboration. Theatre Professor Tom Lindblade, who was Bañagale’s advisor at the time, helped him to secure some funding for a project focusing on creating new musical theater.